In my free time, I enjoy writing scripts. I have been stockpiling my work and I’m beginning to think, What do I do with them! 05.01.2017 – I have finished a screenplay for a sequel to a movie I love. The film CRASH came out in 1996, based on the novel by J.G.Ballard and the film was written and directed by David Cronenberg. This film has stuck with me and even though I was told “Don’t waste your time” I just wanted to follow the story of James Ballard and see where he might have gone after them events. Who knows what will happen with this but it was a fun story to write!!! 19.09.2016 – Finally finishes my first ‘competition’ script. I can not disclose the name at this time as the author must be anonymous. The script has been copywritten and it took me two years and 10 drafts or so to get it up to speed. My proofreaders say “This is fantastic” and that “Its unique and never been done before” I will be entering it into the Science Fiction category at the PAGE International Screenwriting Awards, so please watch this space! 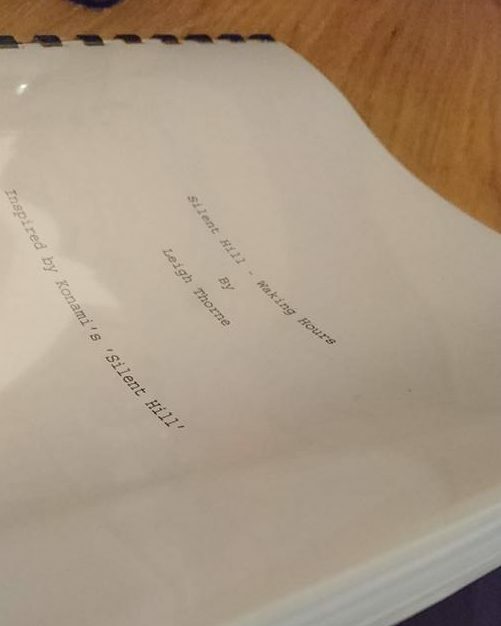 01.09.2016 – For a challenge to myself, I decided to write a Fan Film script for a Silent Hill film. Draft one was completed in 2016. Here is an extract/taster, would you like more?